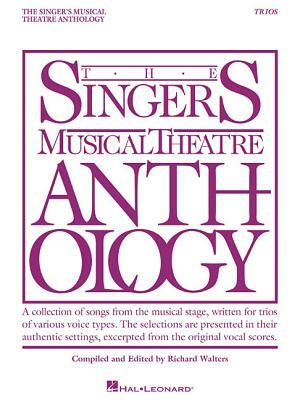 Singer's Musical Theatre Anthology Trios: Book Only (Paperback) | The Drama Book Shop, Inc.
(Vocal Collection). A collection of songs from the musical stage, written for trios of various voice types. The selections are presented in their authentic settings, excerpted from the original vocal scores. Contents: ANNIE: Easy Street * AVENUE Q: I Wish I Could Go Back to College * THE BOYS FROM SYRACUSE: Sing for Your Supper * A CHORUS LINE: At the Ballet * COMPANY: You Could Drive a Person Crazy * DEAR EVAN HANSEN: Requiem * FIDDLER ON THE ROOF: Matchmaker * A GENTLEMAN'S GUIDE TO LOVE & MURDER: Poison in My Pocket * GUYS AND DOLLS: Fugue for Tinhorns * GYPSY: Together, Wherever We Go * HAMILTON: Washington on Your Side * HOW TO SUCCEED IN BUSINESS WITHOUT REALLY TRYING: Been a Long Day * LITTLE SHOP OF HORRORS: Little Shop of Horrors * MERRILY WE ROLL ALONG: Old Friends * LES MISERABLES: A Heart Full of Love * NATASHA, PIERRE & THE GREAT COMET OF 1812: Moscow * PACIFIC OVERTURES: Pretty Lady * SPRING AWAKENING: Those You've Known * THE 25TH ANNUAL PUTNAM COUNTY SPELLING BEE: The I Love You Song * WAITRESS THE MUSICAL: A Soft Place to Land.